Pallets LLC is a pallet manufacturers company that is always looking for creative ways to use pallets, here 70 creative things made from pallets. If you’ve got old pallets lying around and don’t know what to do with them, you’ll be glad to know that there’s an almost unending variety of projects that provide fun and useful ways to repurpose pallets. Following are just 70 of the many creative uses for old pallets — you’ll find everything from bed desks to space ships here. 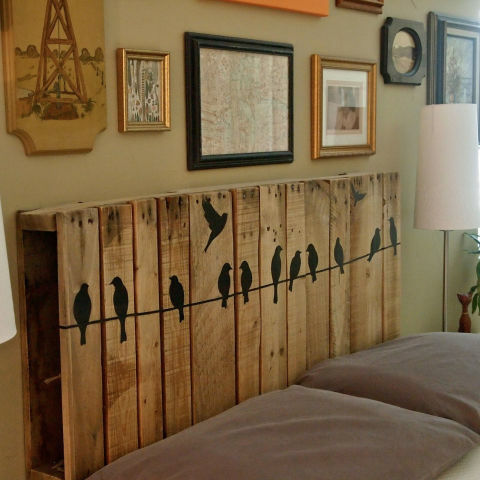 Pallets provide the ultimate rustic look when used as headboards. You can paint, stencil, or otherwise custom design pallet headboard for a unique, personalized statement. Paint or stain them in contrasting or matching colors and hang them on an outside wall to use as planters. Choose trailing, flowering plants or aromatic herbs for best aesthetic effects. Little ones will love their own custom built playhouse made from pallets. Letting them help with design and colors makes it even more special. Older kids can learn valuable carpentry skills by helping out. Fido or Fluffy will love this cute and comfortable pet bed. Paint or decorate it any way you like, and be sure to include a soft, luxurious cushion for your pet’s ultimate relaxation pleasure. 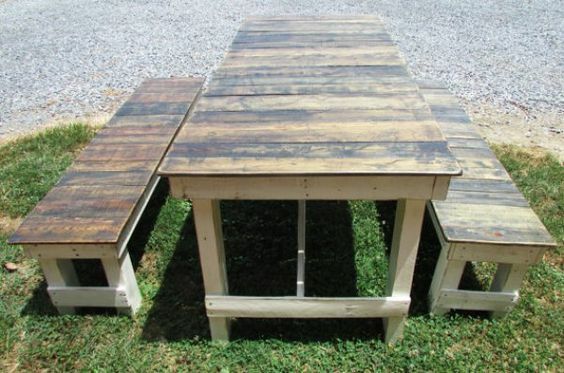 Make a picnic table from pallets and enjoy backyard picnics and barbecues on it. Custom paint it to match your outdoor decor or leave it plain for an uber rustic look. 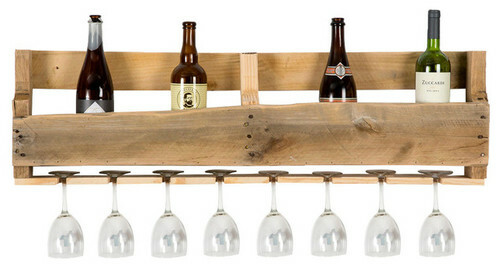 Pallets make wonderful wine racks, especially in homes that strive for that sometimes-elusive shabby chic ambiance. 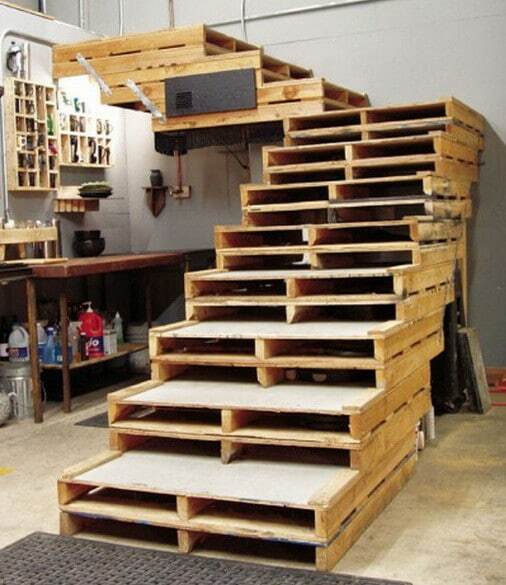 Pallets also make wonderful staircases. Use them in both indoor and outdoor locations anywhere you need an attractive, low-cost set of stairs. 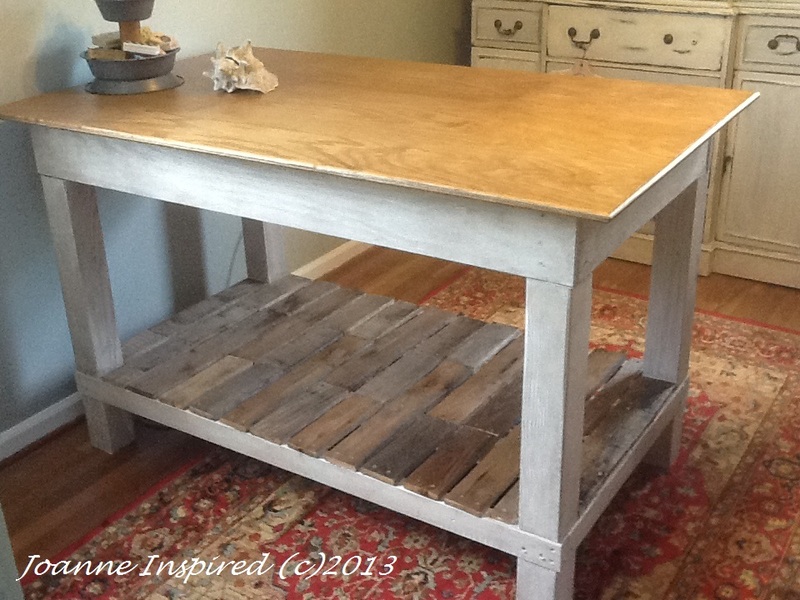 Shabby chic aficionados love the look of coffee tables made with pallets. 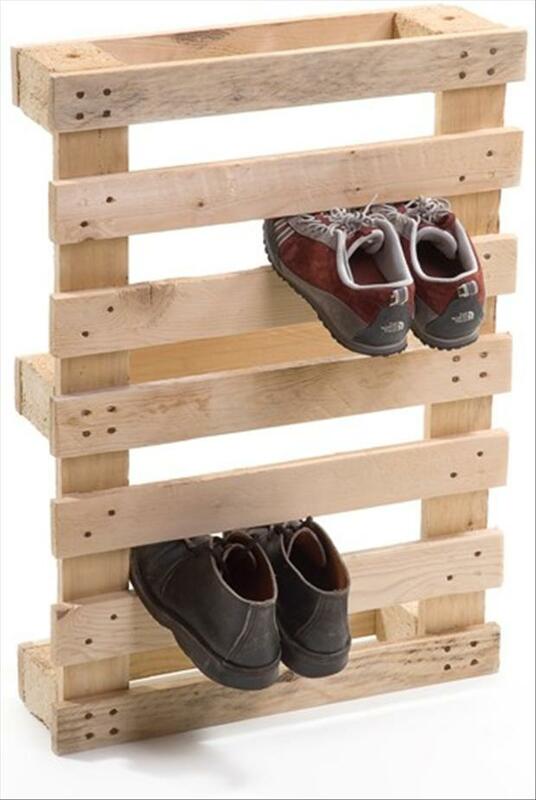 Organize and store shoes with a shoe storage unit made from recycled the pallets. The dimensions of most pallets are perfect for slipping shoes through, and it keeps them neatly organized where you can easily find them. Keep your four-hooved critters safe and sound with a corral made from pallets. Pallets are just the right size and shape to make a strong, sturdy corral for horses or other livestock. 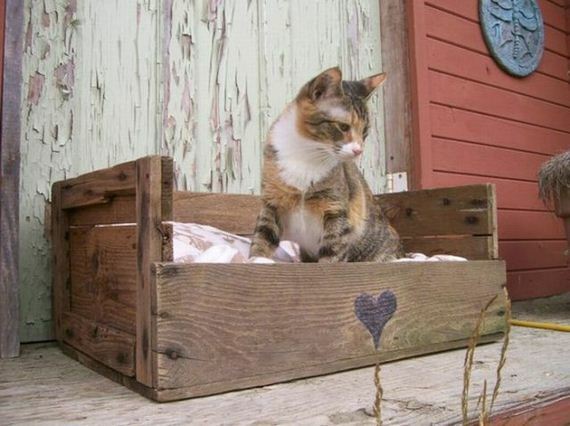 Build an attractive daybed or a standard pet using pallets. Decorate them with stencils and paint for a personalized look. These beds are great for both children and adults, and you can custom build them to meet individual preferences and needs. Custom build the bike you’ve always wanted out of used pallets. Paint it any color you want or leave it bare for an au naturel effect. Keep bikes safe in front of your home or business by building a bike rack out of pallets. Metal bike racks can be expensive, but these cost next to nothing. Bicycle boxes make it extra convenient to slip out to do some shopping on your bike or even take a small furry friend with you on a bike ride. 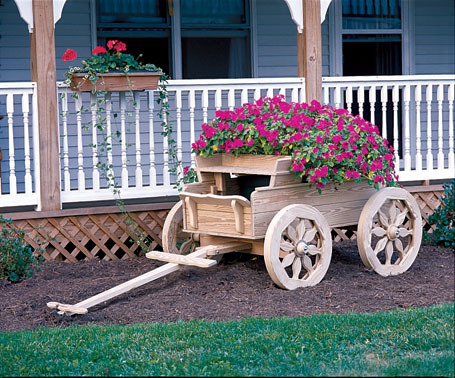 If you’ve ever dreamed up having one of those adorable garden carts spilling over with flowers, now is your chance to build one out of pallets. You can also build bunnies with pallets for whimsical indoor or outdoor decor. These are perfect for a kids’ bedrooms or play areas. Got a big tree with a sturdy horizontal limb? 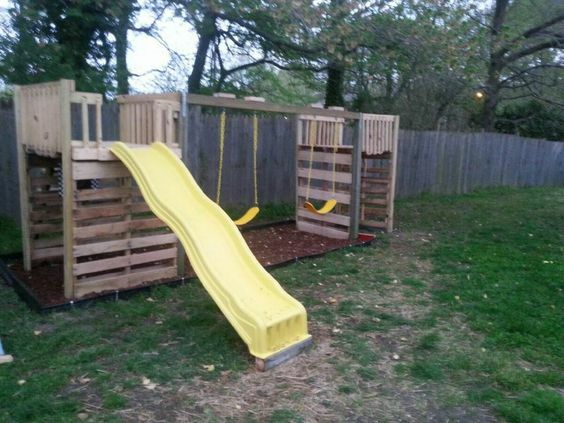 Surpise and delight your family with a swing made from a pallet. 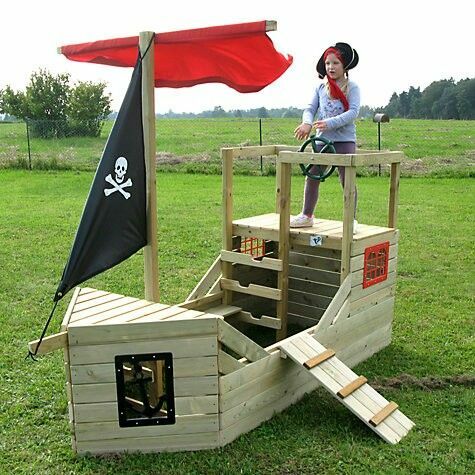 If you need a pirate ship and don’t know how to make one, never fear — you can build one out of pallets. Carve a heart from a pallet, decorate it as you please, and hang it on an interior or exterior wall. 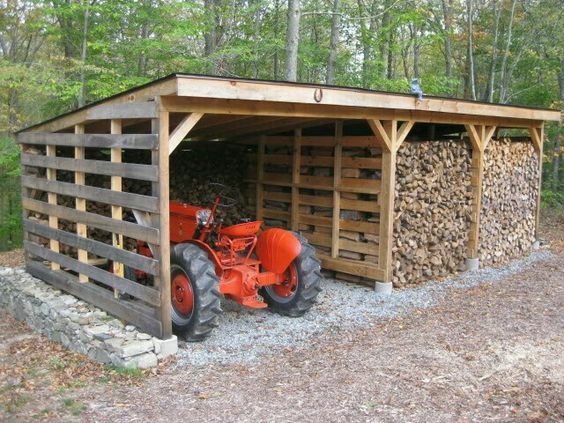 Need a place to stack your firewood to keep it dry? Built a woodshed out of pallets and never have to deal with waterlogged firewood again. 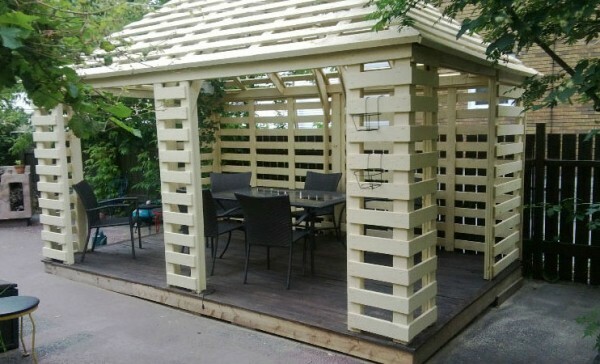 Need a gazebo in your backyard where you can stay enjoy being outdoors even when it’s raining? 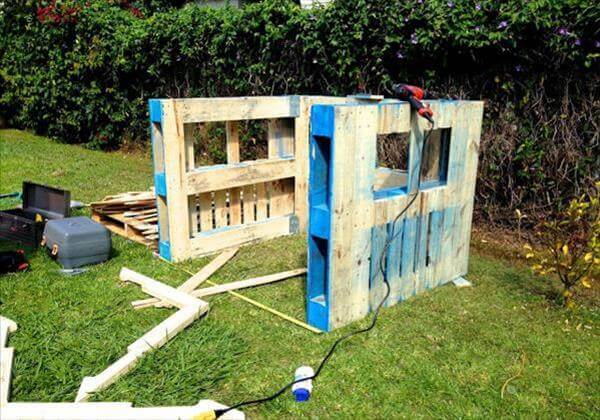 Make one yourself using pallets. 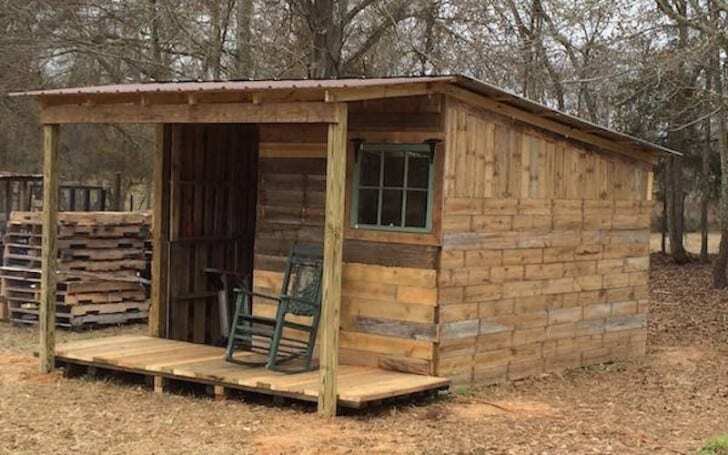 Put guests up in style with an backyard guest house made of recycled pallets. You can go as small or as large as you like. 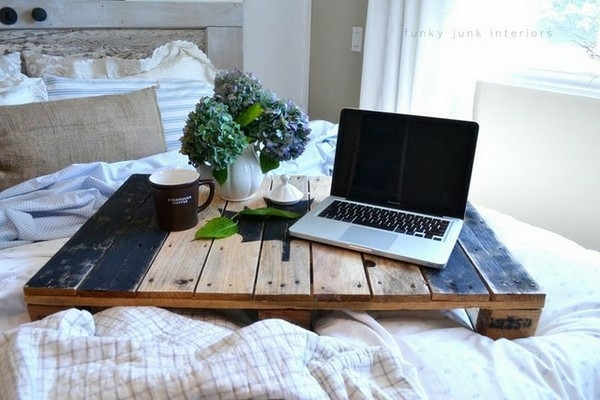 Why buy a new nightstand when you can quickly and easily make your own using recycled pallets? Paint and decorate to match your personal tastes. Treehouses provide hours of backyard fun and even make good camping spots on summer nights. 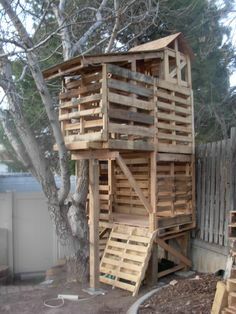 Build one from pallets. Build your own custom-designed play structure in your back yard and keep the children busy having fun and out of your hair. If you’ve got livestock that need a warm, safe place to sleep and to spend cold winter days, you can build a barn out of pallets. Add a quaint note to your outdoor living space by building this cute wishing well out of pallets in a few hours on a weekend afternoon. 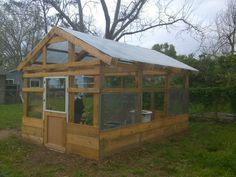 Keep your poultry warm, dry, and safe from predators by building your flock a chicken coop out of recycled pallets. 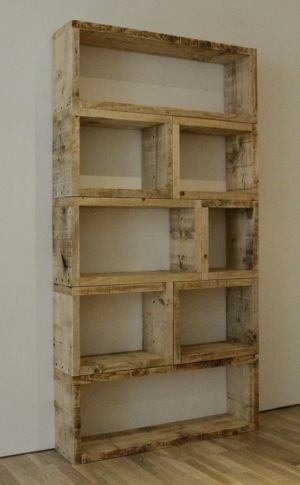 Recycled pallets make excellent shelves. Build them yourself and use them in indoor and outdoor locations. Provide your canine companion with a warm, dry place for when outdoor conditions become unpleasant. Place its favorite blanket inside for extra comfort. 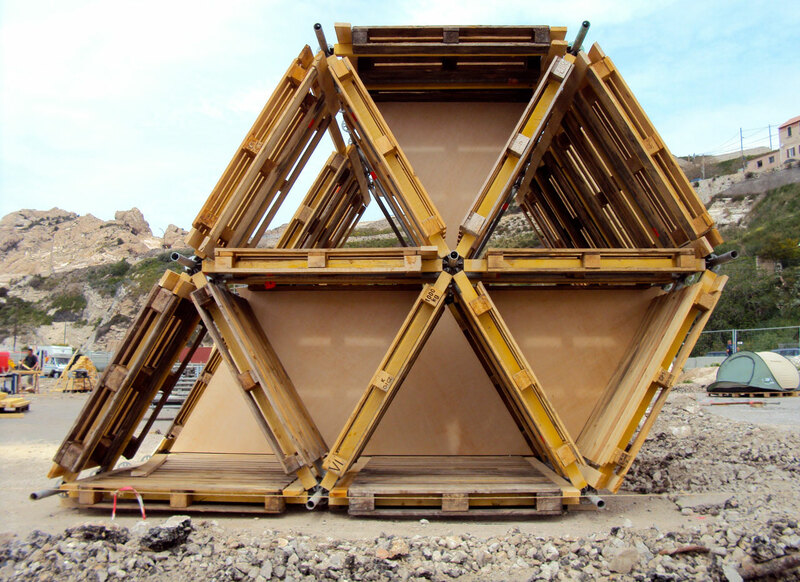 You can also make spaceships out of pallets. They may not fly, but they’ll be wonderful conversation pieces and great backyard art. 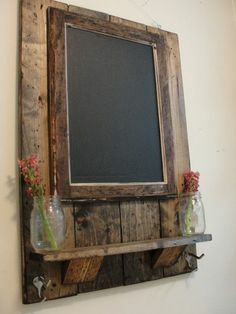 Add a rustic note to your bathroom by making a mirror frame out of an old pallet. Add a shelf to hold personal and decorative objects. 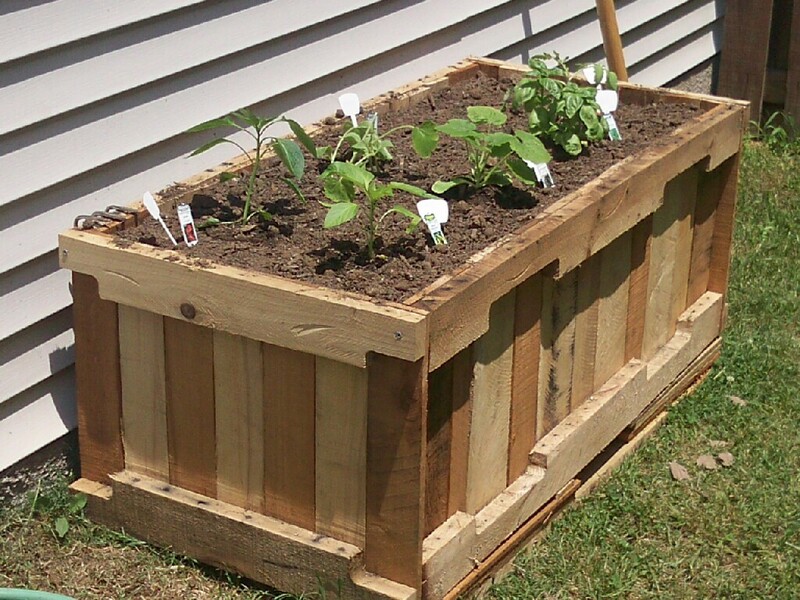 Build a planter from old pallets, place it in a sunny spot in your yard, patio, or deck, and use it to grow flowers, herbs, or vegetables. 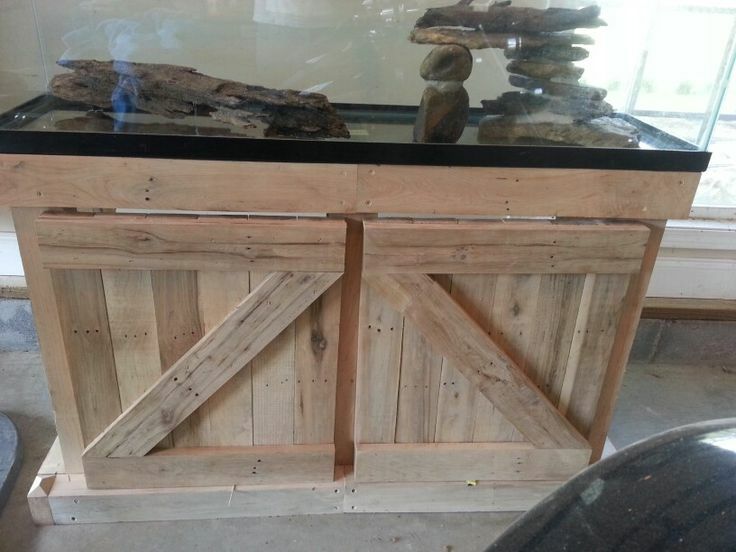 Use the wood from an old pallet to build the outside walls of a swimming pool. Add a liner, fill with water, and splash the day away. Need a coat rack for the foyer but don’t want to spend a lot of money? 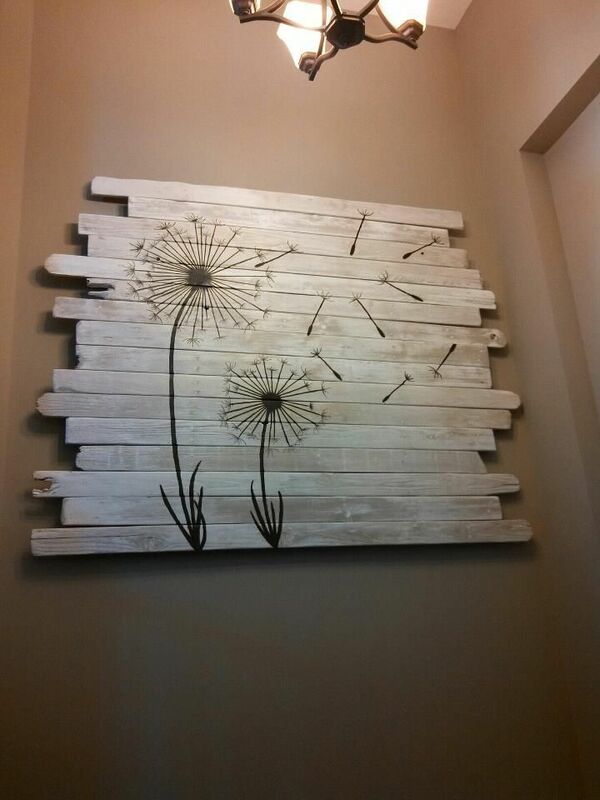 Make one out of an old pallet. 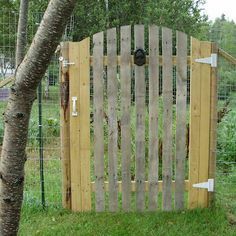 Palettes make excellent outdoor gates — all you need to to is add hinges and a handle and you’re all set. You can paint these or leave them plain depending on personal preference. It’s pretty simple to make an airplane out of a palette. 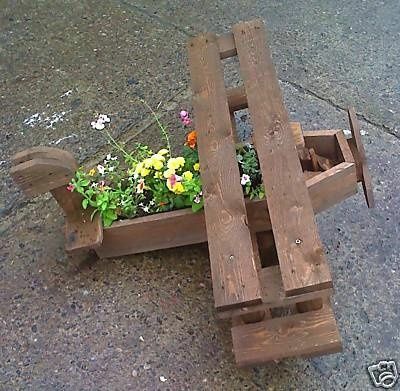 In this instance, the airplane serves as a planter, but there are many potential uses. Use palettes to create something unique and attractive to place on your wall using paint or stencils to make interesting designs. Use the wood from a palette as a background for stenciling in a map of the United States or another of your favorite countries. Display curios and collectibles in shelving made from recycled pallets. You can custom decorate these to match any decor. Old palettes make excellent cars. You can use it as display piece or delight a child by giving it to them as a toy. 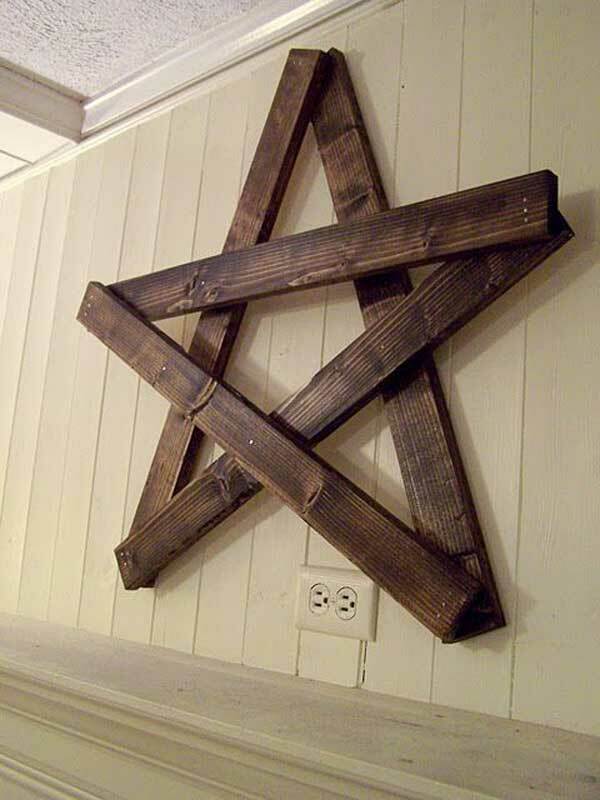 Use an old palette to make a star to decorate your indoor living space or the outside of your house. For a snowman that won’t melt, make one out of pallets. Place it in your yard to delight little hearts during winter, or use it as indoor playroom decor. Who couldn’t use extra workspace in the kitchen? 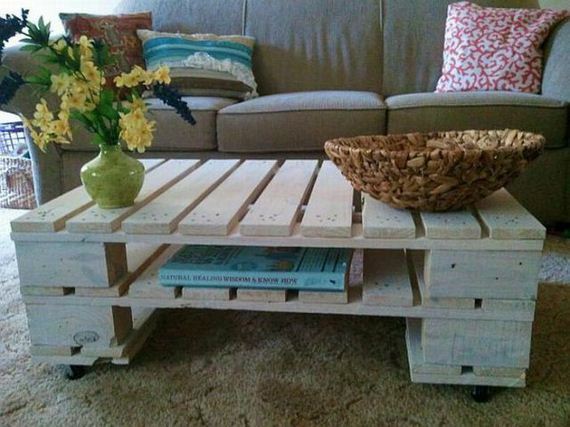 Save money from making one from old pallets. This works for craft rooms and garages, too. 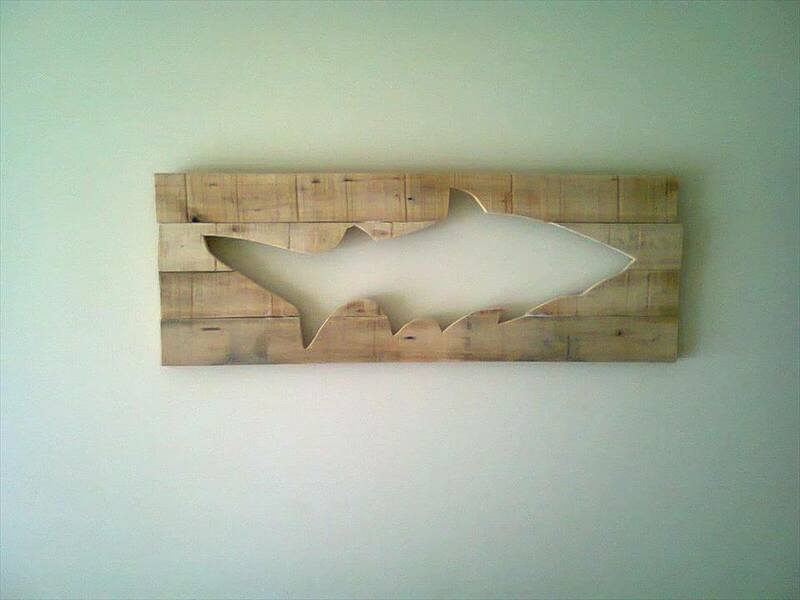 Nail boards from an old pallet together, cut out the shape of your favorite fish in the center, and hang it on your wall. 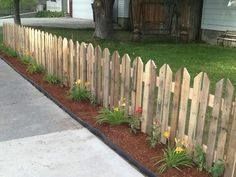 Pallets make great fences because they’re crafted from sturdy and strong wood. Paint them or leave them plain according to the desired effect. You can use old pallets to create a greenhouse frame that will keep you growing all year long after adding clear plastic or glass. Making mud pies is still a cherished childhood ritual. Build a mud kitchen out of old pallets for those scrumptious backyard creations. 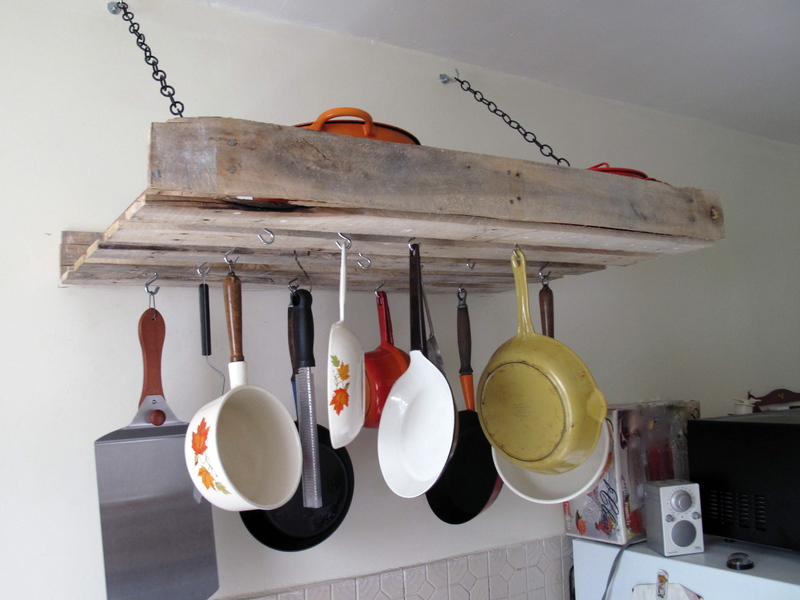 You can also use pallets to store and organize pots and pans in interior kitchens. Hang a pallet near the ceiling, add some hooks, and you’ve got instant storage. Another way that you can use recycled pallets in the kitchen is to make them into cabinets for a rustic, charming look. Why not? After all, pallets started out as trees, so what’s more fitting than returning them to their roots? 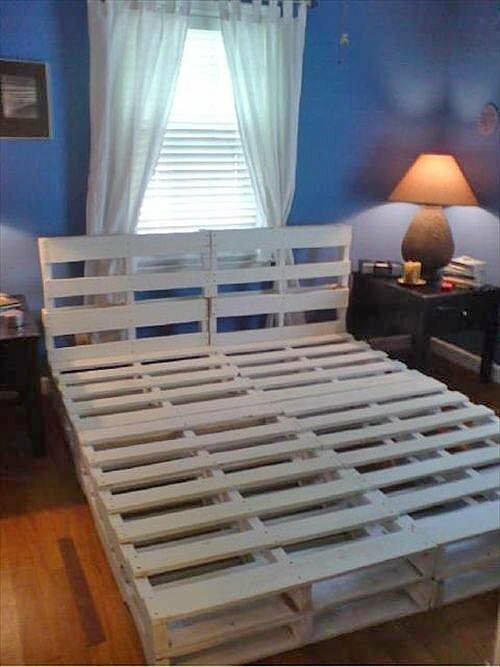 Make a bed frame out of pallets and cover it with the mattress of your choice. You don’t need to use a box spring with a pallet bed frame. In the market for a rustic garden bench but don’t want to spend a fortune? Make one out of pallets instead. 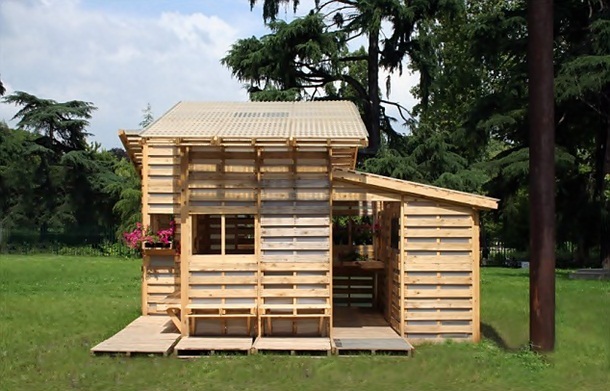 Even entire homes can be built from pallets. Not only will you be using recycled wood, you’ll be saving lots of money. 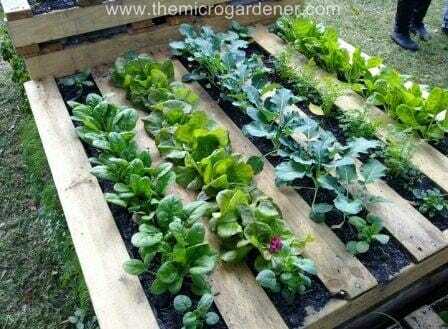 Just plant leafy greens and herbs between the slats of an old pallet to create the perfect little micro garden in your yard, deck, or patio. 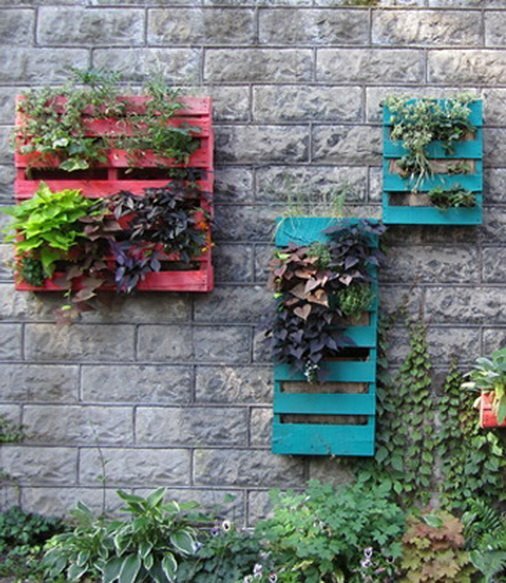 Build a window box from recycled pallets and fill them with blooming plants or culinary herbs. You can make all kinds of doors out of pallets, from sliding barn doors to rustic doors for home interiors. 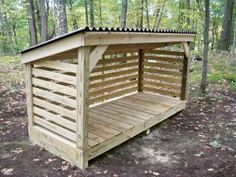 Whether you need it for a vacation home or a primary residence, you can build a cabin using re-purposed pallets. You can use old pallets to craft attractive, durable indoor or outdoor shutters to give your home a classically rustic feeling. 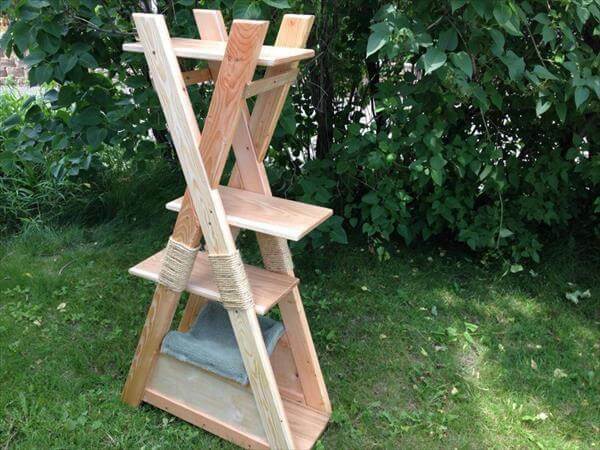 Provide your favorite feline with a place to climb by crafting an indoor/outdoor cat tree out of pallets. 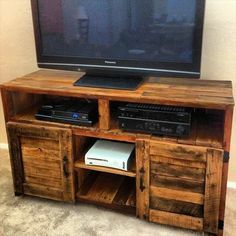 Old pallets are ideal for when you want to make a customized TV stand. Paint, stain, or stencil them to match existing decor, or leave them plain. If you’re a tropical fish aficiando, you undoubtably know the value of a good aquarium stand — repurposed pallets are perfect for this. Repurposing pallets to make guitar stands is an excellent way to store instruments when they’re not in use. 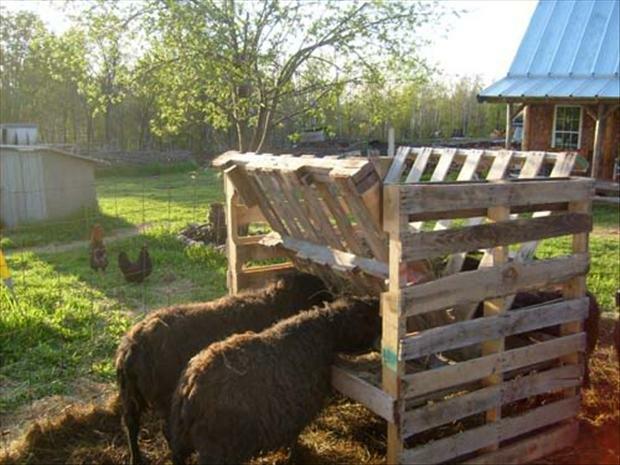 You can make a trough out of pallets to provide a convenient outdoor feeding station for sheep, cattle and other livestock. 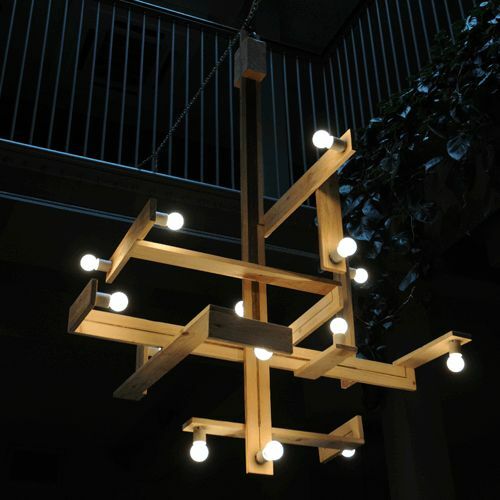 If you need a chandelier that reflects the unique character of your home, consider making one out of old pallets. Everyone needs a bed desk or a computer monitor stand (check out this monitor stand diy). 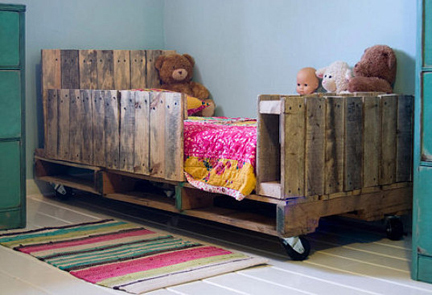 Make one out of recycled pallets for yourself or to give to a loved on as a gift. Create a cool cross between a hammock and a swing by making this comfortable outdoor bed out of repurposed pallets. 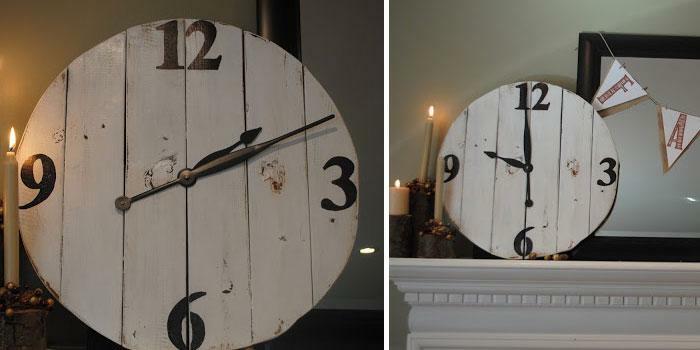 Create a clock by cutting and old pallet into a circle, painting or stenciling on the numbers, and installing craft-store hands and movements.